It's 22:49 in Chincoteague Island, USA right now. 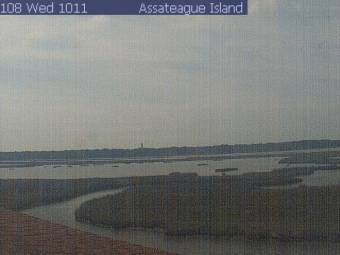 View towards Assateague Island A webcam in Chincoteague Island, Virginia with image archive, weather data and timelapse videos. Chincoteague Island, Virginia: Chincoteague Bay, 0 miles away. Ocean City, Maryland: Boardwalk Beach Cam, 36.4 miles away. Ocean City, Maryland: Plim Plaza Hotel, 36.4 miles away. Mardela Springs, Maryland: Mardela Middle High School, 41.8 miles away. Rehoboth Beach, Delaware: Rehoboth Beach Cam, 56.4 miles away. Rehoboth Beach, Delaware: Boardwalk Plaza Hotel, 56.4 miles away. Christchurch, Virginia: Christchurch School, 67.1 miles away. Magnolia, Delaware: McIlvaine Early Childhood Center, 78.8 miles away.